Al Perna was born in Camden, New Jersey on April 29, 1921. He was the eldest son of five children (three boys and two girls). His father was a master plumber and Al worked with his father as a plumber’s helper from the age of nine. He joined the Civil Conservation Corps at age 19, and, when the war broke out, Al enlisted in the Army. He enlisted on the 23rd of November, 1942, in Philadelphia, Pennsylvania. He was followed in the service by his two brothers, Bill and Frank. During the war, Bill fought in France and Frank spent three years in the Burma-China campaign. 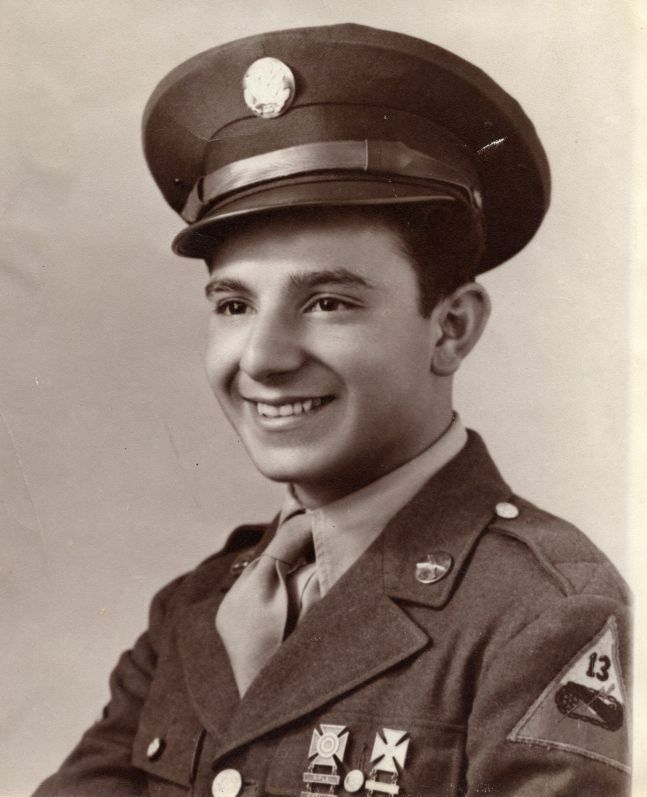 Al served with the 39th Infantry Regiment of the 9th Infantry Division, and participated in various battles, starting in North Africa. 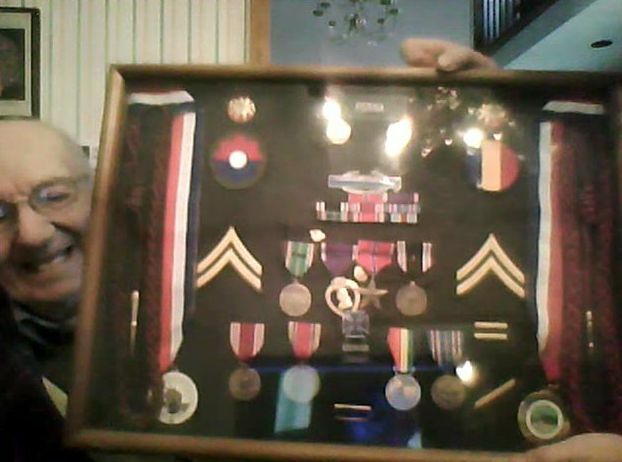 Some of the memorable places Al went through during his service were Safi, Kasba, Port Lyautey, onto Sicily, Palermo, then fighting in Normandy during Operation Cobra, onto Dinant, Namur and Liege in Belgium, eventually helping in the penetration of the Siegfried Line at the German border. On September 20th, 1944, Al’s Company came across a cement bridge in the area of the town of Lammersdorf. The bridge was still in tact. Company H is a “Heavy Weapons” Company, and Al was manning a 30 caliber water-cooled machine gun. He and his men received orders to cross the bridge and hold it until the supporting tanks would get there, and safely crossed the bridge. Together with E Company of the 39th Infantry Regiment, they set up a “U” shaped defense line, so no one could blow up the important bridge. 4 days later, several snipers fired on them, and a full on counter attack followed. While manning the machine gun, Al was hit by a mortar round which knocked him unconscious. To make matters worse, his fellow men thought he was dead, and left him behind while they retreated across the bridge. Al woke up to find many dead soldiers all around him. Two German soldiers standing over him were poking him with their bayonets to see if he was still alive. They took him prisoner and Al remained Prisoner of War (POW) until the war was over. On September 30th, 1944, he was listed as Missing In Action (MIA). Al was sent to Germany and was used as a forced laborer building homes for burned out houses of German civilians. He was a free man again when his POW camp was liberated on April 15, 1945. Al Perna was sent to a state-side hospital for wound care, rehabilitation, and debriefing. Al asked to leave the hospital so he could get home, put the war behind him, and get on with his life. Anxious to get back to work, he worked as a laborer with Campbell Soup while continuing to hone his craft as a plumber with his father. He met his wife Felice shortly thereafter and asked her to marry him after knowing her for only two days. Al and Felice made a home in South Philadelphia and were married for 59 years until Felice’s passing in 2005. They have two daughters, four grand children, and four great grandchildren. Al became a very successful master plumber and personally mentored many young men into the plumbing business. He also enjoys sports, playing cards, theater and movies, social events, and most importantly, being with his family and friends. Last year, Al embarked on a fun vacation to Disney World that he insisted on doing alone and had a fabulous time. Al is a very young-at-heart 91 year old who enjoys good health and an amazing zest for life. I had the honor to get in touch with Al and his lovely family, and it was a real pleasure to talk to him. His memory about the events is clear, and his way of telling a story is very entertaining. Mr. Perna sure is an inspiration to me, and I am honored to have him on my website here.